Tazza; silver-gilt; embossed and chased; Air in landscape; border of strapwork scrolls etc; inscribed. ; knop chased in relief with festoons, lion masks, etc; inscribed. ; foot similar to border; bottom of foot with convex plate engraved with arms of Count von Thun of Bavaria; inscribed. Commentary on this tazza: The fantastic 'scroll-stool', which is such a conspicuous feature of the Justice and Prudence tazze (cat. nos 27-8), has again been introduced by Paul Hübner into one of the Four Elements, thereby helping to give his set a greater sense of unity. Furthermore, the emblematic figure, like that of Prudence, is seen from the back - indeed, the similarities between these two figures are quite striking. The sense of movement and balance is, perhaps, more successfully conveyed in the Prudence figure, and the gesture of the right hand of Air, with its clumsy foreshortening, undoubtedly mars the effect. 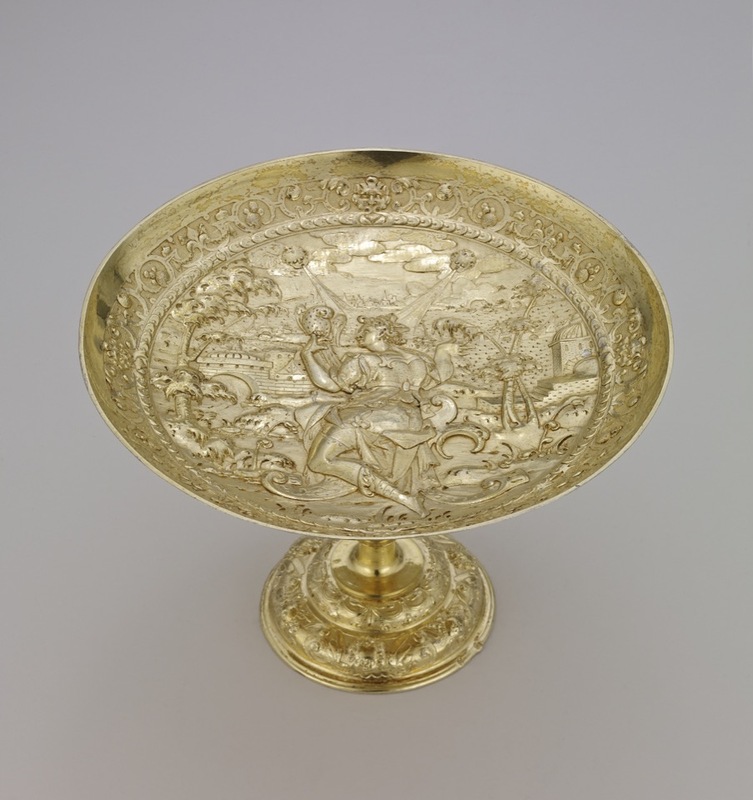 Dr Weber has concluded that the figure-scheme of this Waddesdon Bequest tazza of Air is a mixture of the Air and Prudence tazze from the 1594 smaller set of tazze in the Palazzo Pitti, which in turn can be related to Jost Amman's woodcuts in the posthumously published Kunstbüchlein of 1599 (Weber 1970, pp. 343-4).